-- Please Choose an Option --	24" 25" 26" 27" 28" 29" 30" 31" 32' 33" 34" 35" 36" 37" 38" 39" 40" 41" 42" 43" 44" 45" 46" 47" 48" 49" 50" 51" 52" 53" 54" 55" 56" 57" 58" 59" 60" 61" 62" 63" 64" 65" 66" 67" 68" 69" 70" 71" 72"
-- Please Choose an Option --	0 1/16" 1/8" 1/4" 5/16" 3/8" 7/16" 1/2" 9/16" 5/8" 11/16" 3/4" 13?16" 7/8" 15/16"
-- Please Choose an Option --	30" 31" 32" 33" 34 35" 36" 37" 38" 39" 40" 41" 42" 43" 44" 45" 46" 47" 48" 49" 50" 51" 52" 53" 54" 55" 56" 57" 58" 59" 60" 61" 62" 63" 64" 65" 66" 67" 68" 69" 70" 71" 72" 73" 74" 75" 76" 77" 78" 79" 80" 81" 82" 83" 84" 85" 86" 87" 88" 89" 90" 91" 92" 93" 94" 95" 96"
-- Please Choose an Option --	0 1/16" 1/8" 3/16" 1/4" 5/16" 3/8" 7/16" 1/2' 9/16" 5/8" 11/16" 3/4" 13/16" 7/8" 15/16"
Genius Offers NEW Expanse Porch Windows According to a recent NAHB survey, over 65% of new homes are built with a porch. In response to increased demand for porch enclosures, we have added a new outdoor living product to our line-up. Meet Expanse! 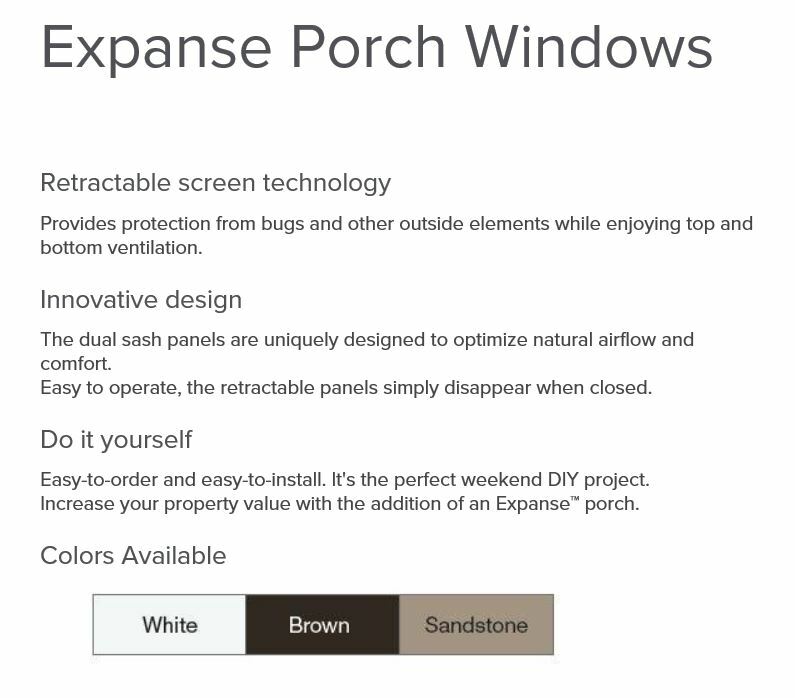 Expanse is the industry's first porch window with retractable screens. Available in extra-large sizes, this patented, dual-sash window design offers expansive views and convenient ventilation - all while offering protection from the elements. 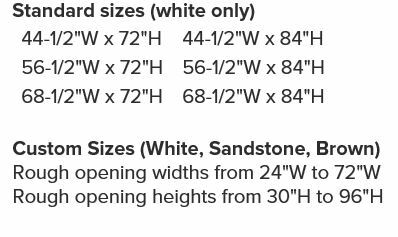 The Expanse product is available in both standard and custom sizes, ranging up to 6' x 8' in size and is available in three colors: white, sandstone, and brown. Expanse is an affordable way to add a unique space and increase property value.